Cocktail outfit consisting of a black woollen and velvet dress with attached corded silk waist petticoat, tulle hat and velvet chocker. Worn and given by Evangeline Bruce (1914-1995). Mrs Bruce was the wife of the Honourable David Bruce, US ambassador to France from 1949 to 1952. In the notebook of the Dior Archive, the dress is referred to as a 'Restaurant Dress'. "Dior launched his new house on 12 February 1947 and became an overnight sensation. His voluptuous collection was the antithesis of lean, boxy wartime fashions. Instead, feminine designs featured rounded shoulders, a womanly bust and a hand-span waist above enormous skirts. It was christened on the spot by Carmel Snow, editor of American Harper’s Bazaar, as the ‘New Look’. The amount of fabric required to create a New Look garment – typically 15 metres in a woollen day dress, 25 metres in a short taffeta evening gown – caused outrage, for rationing was still in place. The collection was shown in secret to Princess Margaret at the French Embassy in London. But despite attempts by the Board of Trade to suppress it, the New Look was unstoppable." 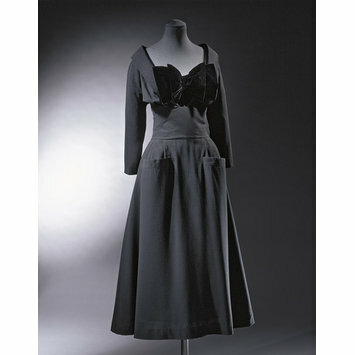 Named after the fashionable Parisian café Maxim’s, this dress featured in British Vogue’s first coverage of Christian Dior. In 1961, designer Marc Bohan was similarly inspired when he named a black sequined dress in his Autumn/Winter collection for Dior, Maxim’s. The sheen of the vast bow is set against the matt surface of creped wool. 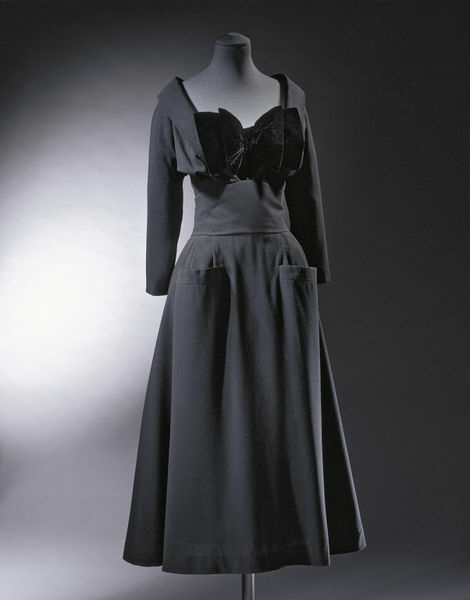 This dress and the suit 'Bar' were the two outfits which epitomised Dior's New Look and were much featured in the fashion press of spring and summer 1947. The natural female curves are exaggerated - the bust is emphasised by the large set-in bow, the waist is drawn in tight by a cummerbund-style lower bodice and the hips are rounded out by inner stiff net frills and outer unpressed triple pleats falling into stand-away pockets. The back skirt is given fullness by a pair of large inverted pleats and Dior was to elaborate on this back theme in his 1948 Envol and Zig Zag collections. According to French Vogue (May-June 1947) this is a luncheon dress but the low, almost off-the-shoulder square-neckline (secured inside by a cased elastic drawstring) suggests cocktails. The intricately cut garment depends on a boned foundation and a stiff grosgrain petticoat. It back fastens with zips and self-covered buttons.